My Trip of a Lifetime by Sally Miller | ExperiencePlus! 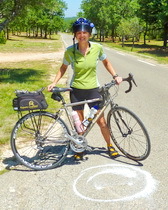 I just completed the trip of my lifetime which is more commonly known as Bicycling the Best of Provence Plus! 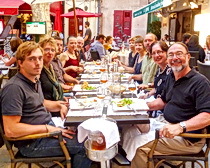 and the Luberon and Aix tour with ExperiencePlus!. I was granted the trip through the ExperiencePlus! Send A Teacher Traveling Award. I teach elementary art and have enjoyed biking as a hobby and form of exercise for many years. My goal is to bring back to the classroom what I’ve learned from this experience which will give everyone at my school awareness of a culture they might otherwise never have had the chance to explore. Seeing the places Van Gogh and Cézanne lived and painted gave me heaps of new ideas for art lessons. Experiencing the culture of France has provided me with insights to share about the people, food, architecture, history and landscape. We’ll spend the school year incorporating the Roman and medieval architecture and artists of France into our art curriculum. Biking combined with sight-seeing cannot be matched. A whole new perspective is experienced by traveling on a bike. I am spoiled and now hooked! Most of my new companions on the trip had been taking bike tours for many, many years and had tried several other bike touring companies. Once they went with ExperiencePlus!, they never looked back nor ever considered another bike touring company. I can see why. The tour leaders are awesome: very knowledgeable in food, wine, people, history, culture, and are very patient. They take care of you in every way making sure you feel comfortable with the route by marking it every morning. If there is a turn to make, it is marked and after the turn it is marked again to ensure confidence you’ve gone the correct way. Special sights and water refill stops are also marked. If there was ever an area where it wasn’t clear which way to go, one of the guides stayed at that spot to point you in the right direction. The support van was never far away and was always on the lookout keeping in touch with every rider. It may sound like herding cats, but somehow they did it! The thing that made the biking so special was that the scenery was breathtaking and totally different each day. Each ride seemed to get better and better. Vineyards, olive trees, apricot, cherry and apple trees were everywhere. 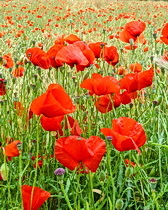 Red poppies mixed in wheat fields, gnarled trunks of the grape vines and olive trees with mountains in the background, the Provence farm houses, medieval and Roman ruins, Mont Ventoux, and small hilltop villages made for an outstanding backdrop for biking. There was a huge variety of sights to stop and visit along the way each day. The trip began in Arles with a bike fitting, and by the way, the bikes were top quality and totally comfortable. (I recommend a road bike for the hills!) 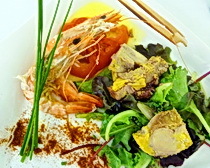 Then we had dinner at a local chef’s home. This is what sold me on taking this bike tour. It was an amazing 4-course meal and was a great way to start a trip. 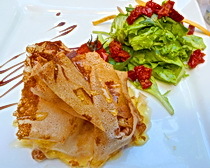 It set the mood for all we were about to learn about the food and drink of Provence during the bike tour. Arles is where Vincent van Gogh lived for a while and he painted many of his famous paintings here (all marked throughout the village). It also has lots of ancient Roman architecture. I recommend arriving there at least one day early to check it out. On our first morning biking out of Arles, we had about 2 hours to spend at the Saturday market. 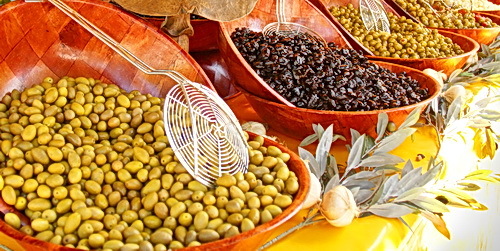 It was the best market I’ve ever seen: special food, spices, fruit, cookies, olives, tapenades, cheese, meats, linen clothing, tablecloths, and baskets that we never saw in any of the other villages. 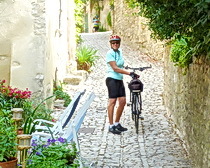 Then we biked a short route to St. Remy, our home for the next two nights. St. Rémy was a sweet village with men playing their afternoon game of boules, full of scenes from Van Gogh’s paintings, along with lots of olive trees (we also went to an olive mill for a demonstration). We had time to visit the sanitarium where Van Gogh lived and toured his famous bedroom and gardens. We were also lucky to be in St. Remy to see a new style of bull fighting where instead of killing the bull a slew of young men get into the ring and attempt to pull tassels off of the bull. The Roman ruins of Glanum are also in St. Rèmy. The biking routes in this area had lots to explore: it was amazing how hidden treasures like Les Baux and the Alpilles hills seemed to appear regularly. 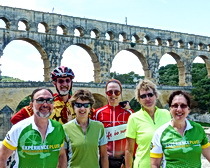 The rest of the biking took us to my first castle, Château de Tarascon from the 15th century, Pont du Gard dating from 20 B.C., and on to St. Quentin la Poterie with a tradition of pottery making dating back to prehistoric times. Our next stop was the beautiful medieval village of Uzès, now a favorite of mine. Then we continued through the heart of the Côtes du Rhône vineyards with a visit to Châteauneuf du Pape and on to Vacqueyras surrounded by vineyards set against the foot of Dentelles de Montmirail Mountains. An extra loop through Vaison-la-Romaine with its incredible Roman and medieval village was super interesting. A chance to climb the giant Mont Ventoux turned out not to be an option for me because I spent way too much time at the villages of Sablet, Séguret, and Vaison. 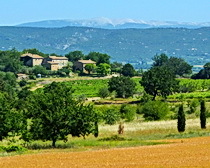 The last three days were spent biking through the hilltop villages of the Luberon Natural Park that Peter Mayle featured in his book “A Year in Provence.” Seeing the next hilltop village while standing at another was remarkable and biking up to it was rewarded with more great views, sights to see, and, if we were lucky, ice cream! The accommodations on the trip were incredible. They were beautiful, comfortable in every way, had great balconies and views, and the swimming pool after the ride was very relaxing. One hotel had waterfalls and a stream running through it and another was a luxurious farm house made into what seemed like a spa resort. The food. Wow. The tour leaders chose fantastic places to eat our evening meals together and picked an outstanding menu reflecting the authentic flavors of Provence. They taught us all about aperitifs of the area, wine specifics, tapenades and olive oil, very specific foods that were special to Provence (foie gras, terrines, truffles), and, of course, desserts. The presentations were amazing. It was like going on a culinary trip, too. I have never learned so much about food and drink from an area. If you’re looking for a very special trip where everything is taken care of for you and you want to immerse yourself into another culture, ExperiencePlus! Bicycle Tours is the place to look. I venture to say that it will be your trip of a lifetime.